ParkerVision, Inc. (NASDAQ: PRKR) shares rose 50.6 percent to $3.90 in pre-market trading following favorable patent decisions versus QUALCOMM, Inc. (NASDAQ: QCOM) announced Tuesday. Biocept Inc (NASDAQ: BIOC) rose 20.8 percent to $2.73 in pre-market trading. Biocept reported a Q4 loss of $0.27 per share on revenue of $1.29 million. Seanergy Maritime Holdings Corp. (NASDAQ: SHIP) rose 20 percent to $1.140 in pre-market trading. Seanergy reported a deal for early termination of credit facility resulting in material gain, estimated to be $11.4 million. X T L Biopharmaceuticals Ltd (ADR) (NASDAQ: XTLB) shares rose 14.4 percent to $2.46 in pre-market trading after gaining 6.97 percent on Tuesday. Childrens Place Inc (NASDAQ: PLCE) rose 10.6 percent to $110.50 in pre-market trading after the company posted better-than-expected earnings for its fourth quarter. Yintech Investment Holdings Ltd - ADR (NASDAQ: YIN) rose 9.7 percent to $21.10 in pre-market trading after the company reported Q4 results. AeroVironment, Inc. (NASDAQ: AVAV) rose 9 percent to $28.50 in pre-market trading after the company posted a narrower-than-expected quarterly loss. Naked Brand Group Inc (NASDAQ: NAKD) rose 8.3 percent to $2.74 in pre-market trading after surging 18.78 percent on Tuesday. Zagg Inc (NASDAQ: ZAGG) rose 6.7 percent to $6.40 in pre-market trading. ZAGG reported Q4 adjusted loss of $0.08 per share on revenue of $114.9 million. The company also issued a strong FY17 sales outlook. Sucampo Pharmaceuticals, Inc. (NASDAQ: SCMP) shares rose 6.7 percent to $12.00 in pre-market trading after reporting strong Q4 results. Sino-Global Shipping America, Ltd. (NASDAQ: SINO) rose 5.5 percent to $2.70 in pre-market trading after climbing 9.40 percent on Tuesday. Health Insurance Innovations Inc (NASDAQ: HIIQ) shares fell 13.5 percent to $15.00 in pre-market trading. Health Insurance Innovations reported a secondary offering by selling shareholders. Express, Inc. (NYSE: EXPR) shares fell 10 percent to $9.60 in the pre-market trading session. Express reported in-line earnings for its fourth quarter, but issued a weak outlook for the current quarter. Hydrogenics Corporation (USA) (NASDAQ: HYGS) shares fell 9 percent to $5.60 in pre-market trading after the company posted a wider-than-expected quarterly loss. Urban Outfitters, Inc. (NASDAQ: URBN) fell 6.1 percent to $23.85 in pre-market trading after the company reported downbeat earnings for its fourth quarter. The GEO Group Inc (NYSE: GEO) fell 6.1 percent to $42.00 in pre-market trading. Geo Group priced its 6 million share offering at $41.75 per share. Dynavax Technologies Corporation (NASDAQ: DVAX) fell 5.1 percent to $5.55 in pre-market trading after dropping 1.68 percent on Tuesday. Gladstone Land Corp (NASDAQ: LAND) fell 4 percent to $11.29 in pre-market trading. Gladstone Land reported an offering of 1.4 million shares. Ladder Capital Corp (NYSE: LADR) shares fell 3.7 percent to $14.36 in pre-market trading as the company reported the pricing of its offering of 3 million shares. Bob Evans Farms Inc (NASDAQ: BOBE) fell around 3.6 percent to $54.70 in pre-market trading. Bob Evans Farms posted in-line earnings for its third quarter, while sales missed expectations. The company also raised its earnings forecast for fiscal 2017. Sibanye Gold Ltd (ADR) (NYSE: SBGL) dropped 3.4 percent to $7.63 in pre-market trading after gaining 2.73 percent on Tuesday. Ciena Corporation (NYSE: CIEN) fell 2 percent to $25.67 in pre-market trading after the company posted downbeat quarterly results. 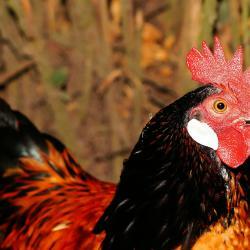 Do Avian Flu Scares Impact Chicken Stocks?